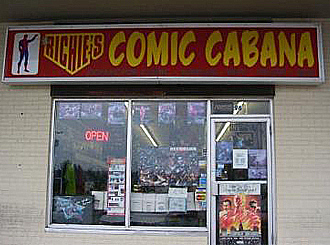 Richie’s Comic Cabana first opened its doors on Meriden Road in Waterbury in 1988. After only a short time there, we realized that the five hundred square foot “cabana” (named because the semi-detached building it was in resembled a small beach hut) was not going to be enough space. It was a year later we found ourselves moving to Frost Road. This not only doubled our size, it also allowed us to increase our stock of comic books and supplies. It was at this location that Richie’s Comic Cabana came into its own as a comic book and sports memorabilia giant. Soon we were also adding several other product lines like: Pokemon and Magic: The Gathering collectible card games; Star Wars, HeroClix, and MechWarrior games; action figures from McFarlane Toys and others; and of course, a full line of comics from Marvel and DC and all other major publishers. After fifteen years of providing the Waterbury area with the best in comic books and everything else, we once again we found ourselves needing more space. Our new location at 96 Store Avenue more than tripled the size of our first store allowing us to expand our amount of comic goodness for everyone. Looking for back issues? We now have two rooms of back issues! As always, we have tons of boxes of back issues on the main floor, but now we also have an entire second room devoted to more hard-to-find and rare comic books as well. And don’t forget to stop and check out our action figure room (it’s actiontastic!) or if you are a sports fan, peruse our cases and cases of sports cards and memorabilia.